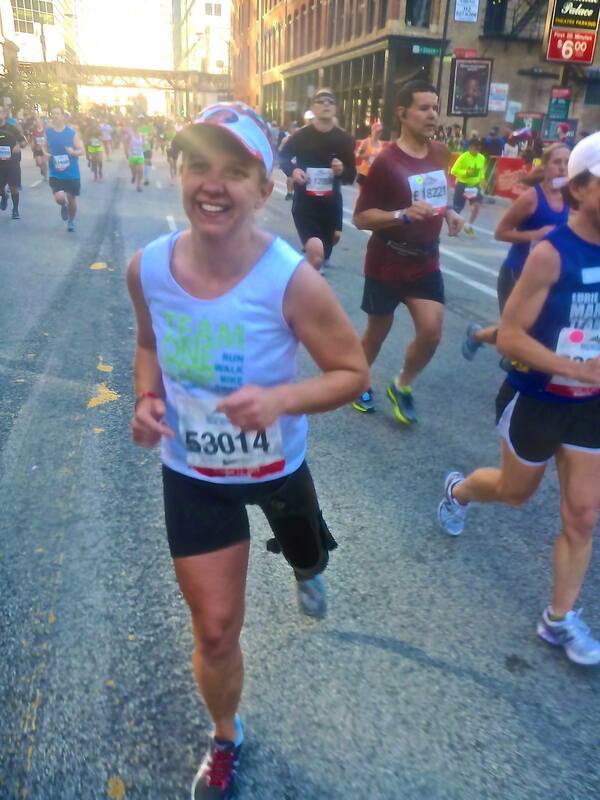 In January of this year, I decided to run the Chicago Marathon. It was a decision made because of a camp that I love and a friend that inspired me to go the distance. Ever since I moved to Chicago four years ago, the Marathon has been one of my favorite days of the year. There was always something that I found inspiring about an entire city shutting down for an entire day, with millions of people coming together to watch 40,000 people take on an incredible challenge. I had always been a part of this event as a supporter, but I never had a real desire to do it myself. 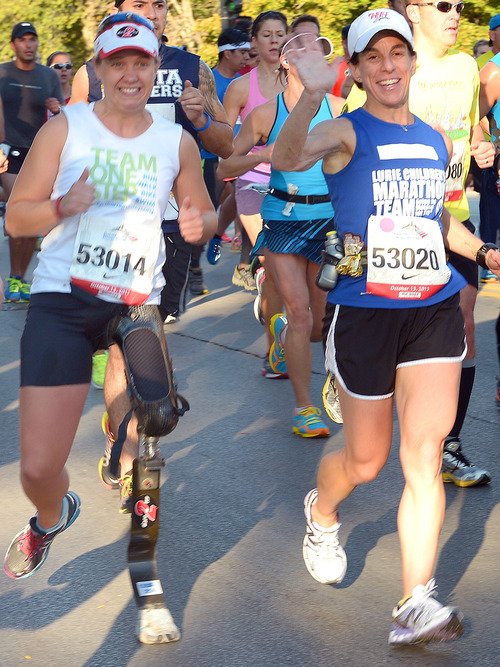 Team One Step gave me the desire, and finally gave me a good reason to cross “run a marathon” off my bucket list. After the initial excitement of signing up, the gravity of what I had done fully hit me. I had agreed to run 26.2 miles despite never going over 8. I was afraid of getting injured, afraid of not being able to hold gels down, and afraid of setting a course record for the slowest time ever. As I thought ahead to that day in October, I was left with a feeling of dread in the pit of my stomach. But that all changed pretty quickly. Shortly after deciding to run, I was talking to my fiend Jen, an experienced marathoner and one of the biggest bad asses I know. She told me how she was tired of running marathons against the clock as she competed for herself, and wanted to run a marathon to help someone else. I in turn told her how, as an amputee, I was allowed to have a guide run with me to ensure the safety of me and other runners. She offered before I could even ask, and just like that, I had a running buddy that would be at my side throughout the rest of the year. Jen joined me for almost every single long run, and for many of the shorter, fun workouts in between. As someone who does the majority of my workouts on my own, it was fun to have somebody to talk to, and teach me that running can actually be a social sport. Not only did I have built-in entertainment, but I had an unmatched sense of accountability; it’s easy to stop when you’re out there by yourself; but when someone like Jen is out there with you, it’s next to impossible. When I signed up for Chicago, I knew off the bat it would not be my top training priority. With the Paratri World Championship being a sprint distance race, my main focus for the summer was having a fast 5K. Unfortunately, it is difficult to train for one of these distances without sacrificing the other, so after a few months of building a base for long distance, I spent the second half of summer focused strictly on speed. This decision paid off at Worlds, but it left me in an uncomfortable spot when I returned from London with just two weeks to build my distance before entering the taper. I could see the look of concern on people’s faces when I told them that my longest run prior to race day would be only 14 miles. As the day got closer, I started to get a little nervous myself, so I decided to combat this by engaging in one of my favorite defense mechanisms: I adopted an aura of overconfidence that bordered on naivety. I convinced myself and everyone that questioned me that I was going to be okay, and that my summer training–while atypical–was not in vain. My triathlon training had left me with a solid fitness base, a high pain tolerance, and a hardy mental game. That plus the energy of the crowds, I told, myself, would be enough to get me through. Then just like that, Marathon Weekend had arrived. I woke up at 3am on raced day, far earlier than was necessary. I bounced around my room with the same excitement as a kid on Christmas morning–after all, Marathon Day is the most wonderful day of the year. 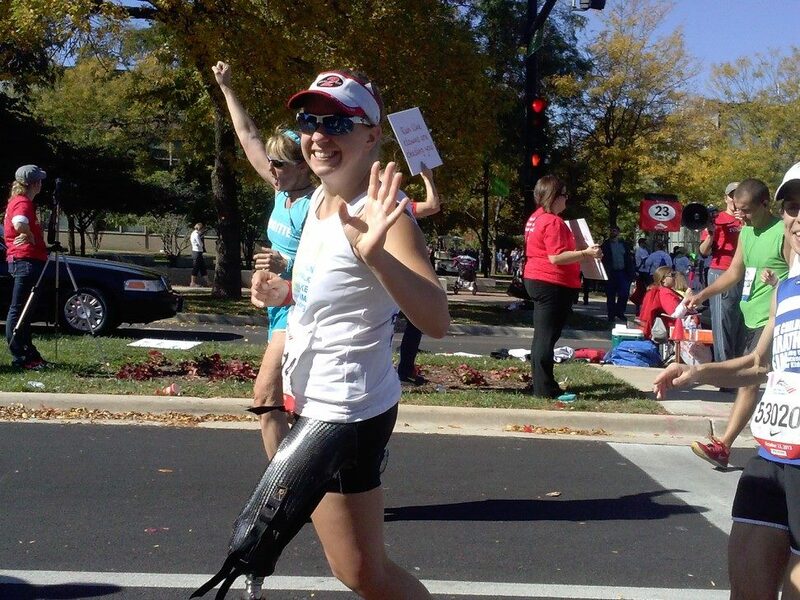 I met Jen near Grant Park, and we made our way over to the Athletes with Disabilities starting area. We had our own tent located right at the start line, with a prime view if the elites warming up in their corrals. I was surprisingly calm in the hour leading up to the start. I think I was just having so much fun taking it all in. After years of watching this day play out on the sidelines, there I was on the other side of it, and I didn’t want to let a single moment pass me by. One of my favorite parts of the day — chatting with my new friend, Marathon Man! We ran down Columbus St. towards the skyline, and as we rounded the corner onto Grand Avenue, I heard the roars of the crowd before I could see it. People were packed side by side, twenty deep, and all of them were cheering their brains out. I looked behind me, looked in front of me, and realized there was not another runner in sight. All of those people–they were cheering for us. After 15 minutes of having the course to ourselves, I heard a line of motorcycles signaling the arrival of the lead pack. A dozen of the fastest humans in the world ran past me at a pace so quick, I would have missed it if I’d have blinked. I’ll tell you right now that there is nothing more humbling than getting passed at mile 1.7 of a marathon by a blur of neon running a 4:45 mile. For the next 10 miles, I could not wipe the ear-to-ear smile off my face. I knew I looked like an idiot, but I had so much to smile about. The sun was shining, the weather was perfect, and my favorite city had never felt more alive. Every neighborhood brought new excitement And the energy along those streets was unlike anything I’ve ever experienced. It was all going by so fast. With each mile marker, I threw my hands up in disbelief, wondering how we had possibly made it that far. I knew going into the race that the spectators were going to be amazing (after all, I was one of them for the last three years), but I had no idea that they would help me as much as they did. I realized that day that the spectators really are what make Marathon Day so extraordinary, and I was moved at every mile by the people I encountered. If you ever find yourself losing faith in humanity, I highly recommend you go out and spectate a marathon. I promise you that you will be amazed by the selflessness that you witness. The spectators come from every walk of life. Some of them are there to cheer on their family and friends, and some are athletes themselves, there to support their running brethren. But a lot of them, they’re there just because. They don’t know anybody running, nor do they have any intention of running themselves. They are not there for recognition, compensation, or anything that benefits them personally. And yet, they wake up at the crack of dawn on a Sunday to stand outside in hats and gloves and pass out water to a bunch of people they’ve never met. How many people do you know that would be willing to do that? But on Marathon Day, these people are everywhere. They line the streets side by side, packed like sardines for 26 miles, becoming friends with the strangers standing next to them, and offering encouragement to the runners who are at their most vulnerable. They come to draw inspiration from the thousands of people who are running toward a dream. But what they may not know is that the runners draw even more inspiration from them. Their cheers, their smiles, their signs–they are all small offerings of hope, letting us runners know that there are people out there who believe in us. Just as amazing than the spectators were the other runners I met on the course. The support that I received from them still warms my heart all these weeks later. I can’t say that getting comments on the course was something new. For some reason, I tend to elicit reactions from other runners wherever I go (I’m not exactly sure what it is, but I think it has something to do with my charming good looks). But in most of the shorter races that I run, I am so caught up in the rhythm of my own body that I tune most of it out. They key to a 5K is grinding your teeth, shutting out all distractions, and going as hard as possible for a relatively short time. But a marathon is a different kind of experience. 26.2 miles is a long time to be out there, and at some point, you crave that human connection. You long for the moment that another runner looks you in the eye and says “great job.” You gain strength from the tacit encounter with the guy running next to you, where your empathy for one another is conveyed through a nod of the head and a flash of the thumb. And when a stranger comes up, pats you on the back, and tells you to keep going, you can’t help but quicken your pace. It’s a beautiful thing when you think about it. And while I usually do my best to block it out, on this particular day, it became my fuel. On this day, I made sure to acknowledge every runner I saw with the same encouragement that they offered me. My favorite part of the Marathon was not sharing the road with the elite pack, or running past the cheerleaders in Boystown, or even crossing the finish line. My most memorable parts of the marathon were those moments I shared with my fellow runners, each of us pushing each other to keep going forward. My childish elatedness remained strong until about the halfway point, when I finally started to settle in. Around that time, I saw my parents and two younger sisters who had come down from Milwaukee to watch. I could see the look of relief on my mom’s face when she saw that I was not only not miserable, but I was actually having fun. The hardest stretch by far was between miles 16-18. I had already run further than I ever had before, and I still had so far to go. I started to experience aches and pains in places that have never hurt before. But I can honestly say that even during that difficult stretch, I never stopped enjoying it. I never had a moment where I wanted it to be over, or where I wondered why I signed up for this, or where I thought I would rather die than take another step. I have a lot to credit for this. Knowing where my family and friends were stationed on the course always gave me something to look forward to. 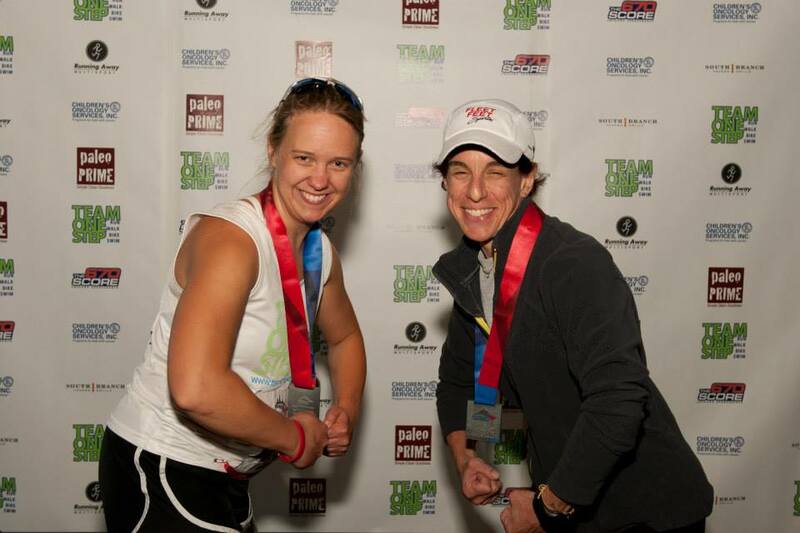 Jen’s constant support made it impossible to stop, and her attentiveness to my glucose levels kept my mood up. And during the times when I should have been crying, I would look at the crowds on either side of me, see look of excitement on a spectator’s face, and I couldn’t help but smile. I quickly realized that the simple act of smiling can do wonders in shaping your perspective. It’s something I have heard other athletes say, but I always figured it was a piece of sport psychology that didn’t actually work. But I can say now that it’s true: if you just smile, you are able to convince yourself that the pain isn’t that bad. Whether it was forced or genuine, I smiled through every mile of that course. And that act alone kept me believing that it was the best day of my life. By the time I made it to mile 23, I was starting to get a little sad. I was tired and I was hurting, but at the same time, I didn’t want it to be over. After spending the last 9 months looking forward to this day, and after four and a half hours of taking it all in, there we were, just a few thousand meters from it all becoming a memory. I started to get emotional as we embarked on the penultimate stretch along Michigan Avenue, knowing before it was even over that I couldn’t wait to do it again. We passed the 26-mile mark, turned onto Mount Roosevelt (really just an overpass, but after 26 miles through a pancake flat city, the nickname couldn’t be more appropriate) and powered up the hill, past the signs for the final 800, 400, 200 meters. As is always the case in the final hundred meters of a race, I found my sprinting legs, which carried me under the giant timing clock that I had spent many days envisioning. That clock read a time that crushed even my wildest expectations, and as I made my way across the timing mat, it was everything I’d hoped it would be. Crossing a finish line is always a magical moment, but this finish line was extra special. This one was a long time in the making. It came with a lot of anticipation, a few worries, and a little doubt. But it also came with a lot of great things. My marathon experience caused me to fall in love with the sport of running, taking it from something I did for fun to something that is an essential part of me. It taught me to appreciate the beauty of running, and to connect to the sport in a very existential way. It built my friendship with Jen on a much deeper level, as we bonded over long runs that brought out my best and my worst. It also helped me grow in a way that I couldn’t have anticipated. The hours that I spent on the road by myself forced me to look closely at who I am, confront my inner demons, and discover what I am capable of. That finish line represented so much more than the end of a race; and crossing it was a culmination of an incredible year of both personal and athletic growth. As soon as I crossed the line, all of the pain that I had been blocking out suddenly hit me like a bag of bricks. I had a knot in my neck so tight that I couldn’t move my upper body, and the muscles in my right leg (the real one) finally began to feel the impact of the last 26 miles. Whoever decided that it’s a good idea to put the water bottles a quarter mile away from the finish chute was not my friend in that moment. Needless to say, I became the pathetic girl who used a wheelchair to get through the finish area. But I was too happy to care. After receiving a life-changing post-race massage in the Athletes with Disabilities tent and getting my hands on every sodium-laden snack I could find, Jen and I made the mile-walk back to the Team One Step post-party. There, I reunited with my family and many of my friends, consumed two days worth of calories, and enjoyed the rest of one of the best days of my life. Trying to sleep that night was comparable to the night after my 13-hour limb salvage, the main difference being that this time around, I was missing the heavy-duty narcotics. The following day was equally painful; the only things getting me out of bed were my insatiable hunger and my afternoon massage. Even though I was hurting, it was the kind of pain that I was proud of. And it was all 100% worth it. Many people have asked me if I will do another marathon. My answer is absolutely, but I cannot say for sure when it will be. I honestly have never had more fun in a race, and you can bet that I’m going to want to do it again. I know that when I do decide to do another, I want to train properly and race it right. For now, my focus will continue to be triathlon, knowing that my goals may shift depending on how the sport grows and changes. At this moment, all I know is that Chicago will not be my last marathon, and whether it’s a year from now or ten years down the road, I will be back.